Somewhere on the road south between Taupo and Turangi things changed: the herds of North Island tourists diverged into 2 groups and "Maori Inc." disappeared. At Rotorua the excessive pricing of anything related to the Maori or their past became a bad joke to us; farther south it was different. 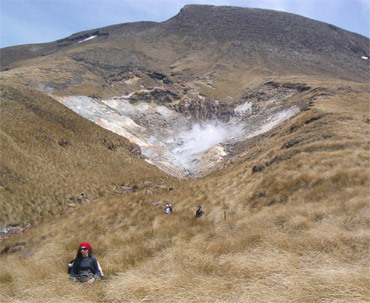 A Maori shuttle bus driver in Tongariro National Park commented that the Maori were opposed to the government charging the nominal fee to overnight hikers using the mountain huts that were on Maori land--it wasn't that they wanted the money, it was that it should not be collected at all. 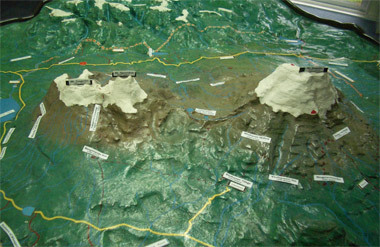 (We of course thought it perfectly reasonable for hikers to pay for overnight shelter and access to rare, fresh water.) Like a bad dream, the pressure to pay at every turn in Rotorua disappeared into the background. Photos like this of the Emerald Lakes kept us all motivated. In Rotorua, tourists of all interests and modes of travel were blended together and indistinguishable, filling their plates with different selections from the buffet of Maori cultural events, hot springs activities, sport undertakings and historical journeys. 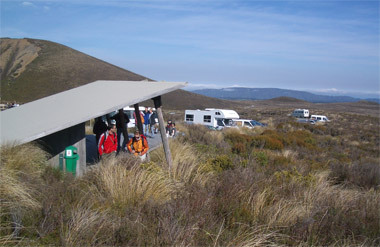 But farther south at Turangi, one of the launching points for activities in the Tongariro National Park, everyone there on the stormy day we arrived seemed to have the same goal, to make The Tongariro Crossing. I'd love to know how many of us milling in Turangi because of the stormy weather came to New Zealand with The Crossing on their itinerary and how many were like us, riveted to a goal of which we knew nothing a month ago. 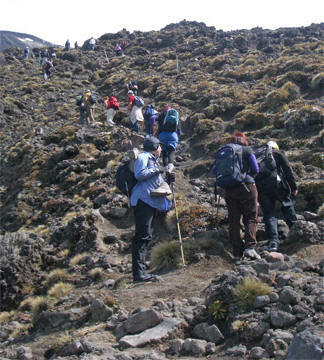 A brochure describing The Tongariro Crossing was plopped down in front of us by an Auckland tourist info trainee who hadn't seen much of New Zealand herself but had completed the day walk and knew that it was on the short list of "must see" items for fit visitors. We took it to heart and added it to our budding plans, originally expecting to pick it up in February on our way back to Auckland. At about 200 miles south of Auckland, The Crossing was in striking distance for those on brief visits to New Zealand and so we were surrounded by other hopefuls from many lands on tight schedules. 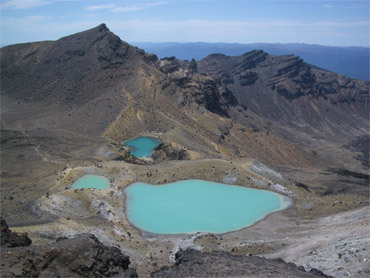 The Tongariro Crossing is a 10-11 mile hike at about the 5000' level between 2 volcanic peaks that, on a rare clear day, gives stunning views of 3 major mountains, lakes, volcanic craters, and the surrounding barren land. Like the Via Ferrata trails in the Dolomites we experienced in the summer, The Crossing allows less trained outdoors people to have an exceptional experience with less skill and time invested than is normally required. Completing the North Circuit loop of the peaks takes at least 4 days and requires carrying food and water and camping or staying in sparsely equipped mountain huts. The Crossing however allows the less initiated to see the best of the views on the Circuit with a 1 day effort and much less encumbered with gear. The problem for all, regardless of the extent of their ambitions, was the weather and the weather this November had been atrocious. We had little trouble believing that New Zealand is the second stormiest country in the world (next to Argentina) or that it had just had one of its worst winters ever. December 1st is New Zealand's official first day of summer, but November 30th in Turangi lashed us all with the worst of the last 6 weeks of terrible rains and winds. High winds are common on The Crossing with 60km/hr or about 37mph winds being considered the cut-off for a safe transit by the tourism folks in Turangi (in the Park itself, the staff considers 50 km winds the safe limit.). The weather can change very abruptly in New Zealand and become rapidly severe, with all being advised to carry heavy clothing for the walk even in the middle of the summer. People die from exposure on The Crossing even before the sun sets on a bad day. There is no food, no water, no intersecting road, and only a couple of huts towards the ends--once you start out you either turn around early or complete it--there is no middle ground. Timing one's hike with the weather is critical both for safety and for seeing anything but the insides of clouds. We were quite prepared to take or wear all of our many layers of clothing and rain gear and to carry an ample supply of food and water, but we needed the weather to cooperate. We arrived in Turangi, one of the major departure points for The Crossing, on Wednesday night and expected to bike to National Park village on Thursday--a closer departure point--and make The Crossing on Friday. But the weather was hideous on Thursday and a quickly formulated "Plan B" was to catch a minibus to National Park instead of riding. The sympathetic tourist info folks called on our behalf and inexplicably, the bus wasn't carrying its trailer for bikes that rainy day. 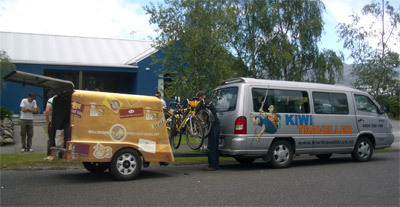 Reluctantly, we opted to spend a second night at Turangi and reserved space for ourselves and our bikes on the minibus for the next day. The forecast for the morning was still intimidating, though not so ferocious. Resigned to an unscheduled layover day, we checked into a nearby hostel with a climbing wall, as indoor climbing seemed like the perfect rainy day activity. Better to be challenged by making our first explosive grabs for just-out-of-reach handholds and grappling with climbing up an overhang wearing a safety harness rather than risking gale force winds on the road in traffic. The fickleness of New Zealand's weather again presented itself the next morning however, as we awoke in Turangi to one of the nicest days we'd seen since arriving in the country. A few clouds dotted the blue skies and the winds were mere breezes. We rehearsed again and again why scheduling the bus ride had been the right decision--a decision based on the latest meteorological information interpreted by the local advisors--but we still were chagrinned. It would have been beautiful biking to Tongariro National Park that day--if the weather held. Our bikes didn't ride inside the trailer as expected.. The collective moans and groans in Turangi where we were, the village of the National Park were we were headed, and the surrounding area must have been immense as people arose that Friday morning to the sight of beautiful weather. We had laid over an extra day, but other people had been stalled out for many days waiting for a break. But none of us were nabbing this gorgeous day to do The Crossing because it hadn't been predicted. The tourist info woman said that for most of the month there had been a cycle of 5 days of terrible weather and then 1 day when the predicted winds were just under the 60km/hr cut-off for The Crossing. It was easy to believe that this was the 1 good day in the cycle and we had all missed it because it wasn't forecasted and so we hadn't scheduled a shuttle bus ride to the starting point. Doing The Crossing is quite the ritual. 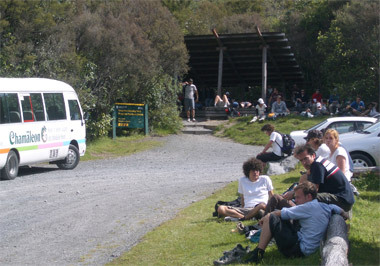 It is done as a 1-way route, so most people hire a ride from one of the villages like Turangi or National Park village. The routine is to be dropped off at 1 end in the morning and picked up at the other end of the trail in the afternoon for a fee of up to about $20US per person. Using one's own transportation is strongly discouraged because of the high incidence of theft and vandalism at the 2 car parks. But most of the hired rides leave between 6:30 and 7:30 in the morning, requiring the "go-no go" decision to be made the afternoon before. Only those risking having their own vehicles vandalized can wait and see what the weather is like in the morning and capitalize on an unexpected good day. The Turangi hostel where we were staying did cobble together a shorter hike using their own van for the guests who happened to be up early enough to hear the informal announcement, as other lodging establishments may have also done. But we had reservations on the bus and at a National Park motel, so we missed the hostel's back-up activity hike and hoped for the best. It was incredibly frustrating to be caught in this waiting game and yet at least we had the time to devote. We had carved out 4 days in our schedule for a chance to make The Crossing, but many people we spoke with or overheard didn't have the luxury of the time, or had already consumed it. Flights home in a few days boxed people in, as did other compelling travel plans. Many were anguished, seeing this opportunity slip away from them at a time of year when it usually would have been a simple matter. And it was at Turangi that we spoke with yet another cyclotourist and heard his tales of using the bus and train for legs of his trip. The steep grades on the Southern Alps pass weren't the obstacle for him--it was the winds. He was a young, big guy and he commented that he couldn't even push his bike into the headwinds. Yikes! None of the cycling New Zealand books talk about this. The mini-bus dropped us off in the afternoon at our isolated roadside motel on the outskirts of the National Park village as planned. On the bus trip from Turangi we located the mountains we hoped to hike around--we could just see the bottom edges of the snow fields peeking out like petticoats under heavy skirts of clouds. We quickly deposited off our gear at the motel and were just beginning the return 1-2 mile walk back from the tiny market to the motel when the sudden arrival of cold winds and hail had us scampering for cover at the gas station mini-market. This was the forecasted harsh weather for the day that had us opting for the bus ride. The arrival of the strong, mid-afternoon, southerly winds from the Antarctic which rapidly dropped the temperatures into the mid 40's°F with alternating showers of rain and hail were the predicted weather that made The Crossing unsafe that day. But even though it was predicted, the sudden change and chill had us again questioning if the improving forecast for the next 2 days would really materialize. But before we were out of bed the next morning at National Park village, we could tell the promised better weather had arrived as there was bright sunlight streaming around the curtains. Peeking out the window revealed that the wicked, chilling winds were still with us, but at least the clouds were few. We'd seen plenty of stunning mornings in New Zealand that were transformed by sheeting rain in an hour's time, but the local forecast had been accurate the last several days, so we were optimistic that the clear skies would prevail. Not only was it an exciting prospect for the day at hand, it was a good sign for the next day, the day we scheduled a shuttle to The Crossing trail head. 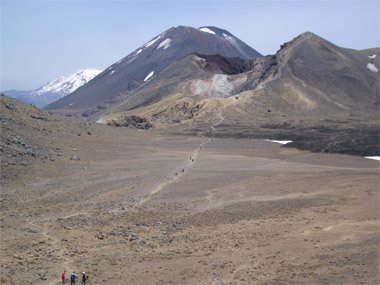 As planned, we spent the morning examining the volcanic and flora information at the visitor's center serving the Tongariro National Park and the afternoon making a 7 mile "tramp" in the area, gaining about 1200' of altitude in the process. We gulped at the nearly $30US we had to pay a shuttle bus driver for the round-trip ride to the center 10 miles from our motel, but once again they had us over a barrel. It was too far to walk to begin a hike and the notorious theft problems in the area parking lots didn't make us eager to risk parking our bikes for hours, even unloaded. Fortunately, it was a stunning day. 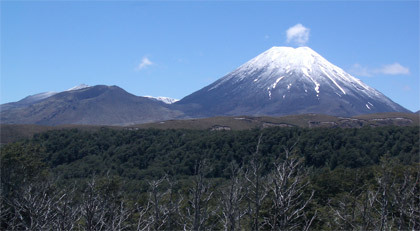 The Crossing would take us across the shoulder of Mt Ngauruhoe. We did suffer unwelcome public ridicule from the shuttle driver who chided us for not making The Crossing that day as he dropped off the folks who were, but the opinions of others later reinforced our decision. The twice daily weather reports for the last 3 days pointed to the following day being the better of the 2, with the snow level rising and the winds decreasing somewhat. When pressed, the visitor center staff in the Park itself indicated that there had been only 3 days in the last month when the mountains were visible and it was looking like we were going to be hiking around them on days #4 and #5. On one hand we felt tremendously lucky to catch 1 of the good days, and presumably would bag a second. On the other hand, it underscored what an incredibly terrible month November had been for us and everyone else. Our pre-Crossing half day hike and time at the info center was a welcome way to extend our visit in this remote area, an area that had taken a lot of planning and adjusting to the weather to make worthwhile. It also gave us a little more time to adjust our muscles to the different demands of hiking and carrying packs on our backs, activities that make us sore in different places than biking does. We also were able to do a test run with our wardrobe in the area's cold winds. Waiting earlier in the day on the roadside for the shuttle bus that was more than a half hour late on the 40° morning with brisk winds made it clear that even with 4-6 layers of clothing on we couldn't stay warm standing around. Our breathable, moisture-wicking wardrobe is designed for a high activity level and is almost useless when we are still. It underscored the importance for us in making The Crossing on a reasonably good day to avoid the hypothermia risk that is very real on the exposed slopes. It was interesting to learn that the desert-scapes we'd be seeing the next day weren't do to lack of rain, but due to the unfortunate combination of human deforestation and harsh winds and low temperatures. Under the best of conditions the vegetation is scant and tends to run a cyclical course that human activity unfortunately interrupted. Once gone, the native growth had been unable to re-establish itself, hence one of the major road in the area being "The Desert Road." Our appointed Crossing day arrived and even from bed it was obvious that the previous day had been brighter. The subdued light coming through the bedroom curtains hinted at the clouds we saw when we peeked between the drapes. Gray skies and brisk winds made it hard to believe that it was the right day for the big hike--the day predicted as the best by a string of forecasts. Nervously we watched the clouds and held our breath as a patch of blue appeared; anxiously we looked for signs of rain out the window facing the densest clouds. But there really wasn't a decision to be made as drizzle and low clouds were predicted for the following several days. This was the day we would make the journey, however it turned out. The understated launching point for the 'tramp'. What we didn't know until we dashed out the door to wait for our shuttle bus was that the temperature had popped up about 20°F from the previous morning. Waiting for the late bus in windy 60° F was far better than the day before when the wind chill factor must have been well below freezing. The thinning of the heavy clouds lifted our spirits as we fixed our gaze down the narrow highway waiting for our lift. Indeed, we had gambled and won--this was THE day to be doing The Crossing--perhaps the best day in 1 or 2 months. Yesterday was OK, as the predicted winds were just below the critical 60kph point and the visibility was excellent, but our winds peaked at 40kph and it was phenomenally warmer with the much higher snow level. There were 2 basic stories among the "trampers" on this day: those who showed up on this premier day by chance, clueless as to what a trophy it was; and those like us who had juggled their schedules to be there at this carefully selected window in the weather. One British couple on our shuttle bus was leaving New Zealand for home the next morning and this day was their 4th attempt in 3 weeks to make the hike. Others we had talked to in the previous days weren't so lucky and would have boarded their planes before this brief break in the weather occurred. The reports among those like us who had waited varied as to whether New Zealand's streak of terrible weather had been 4, 6 or 8 weeks, but for most vacationers even a week of high winds was enough to foil their attempt to make The Crossing. 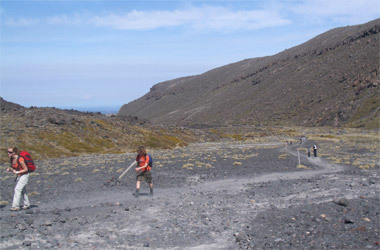 A section of the trail in the first hour of The Crossing. After the 20 minute bus ride, I lingered at the car park a few extra minutes for a quiet spell to savor the beginning of this awaited journey. The nervous energy of the other people interfered a little, and I hoped for a quiet few moments to myself. But we were there at the height of the drop-off interval and there was no lull in the turnover as people disembarked, stood in line to use one of the 2 outdoor toilets, and headed out. We finally went on our way too and I shifted my attention to enjoying the collective excitement of the crowd rather than trying to find a break in it. We marched in single file with an amiable and widely spaced string of what must have been several hundred people in total. Absent was the one-upsmanship posturing that I expected to see, as everyone seemed more focused on their event and less on how they measured up. There were no loud voices in the background commenting on past triumphs or predictions of other people failures; there was no obvious "sizing up" going on; and no one even stared at our sandals on our feet and our boots slung over our shoulders as is usually the case. Instead, it was an eager assemblage of mostly 25-35 year olds hoping they were up to the challenge. "Take a number" in the steeper & rockier terrain. The buzz of languages in the background spanned the globe, with Hebrew, Asian tongues, and Western and Eastern European languages filling in the spaces between the English being spoken. Brits, Australians, and Americans were likely in the majority, but this was quite the international crowd. Though the languages were all different, the preparedness for the adventure and anticipation was a unifying element. Surprisingly, most of the folks we saw were sensibility equipped for the day. The handful of people we saw woefully lacking in food, water, and extra clothing turned out to only be walking part of the route and then returning to the car park. And most of the people made it to the high point of the route in good form, though later in the last hour of the hike some looked very frayed as revealed by their over-red faces and stumbling gaits. We were quite pleased with how our bodies held up as we trudged for several hours to over 3300' from our starting point. Our 10 mile walks to appointments while in Portland in October were designed to be an efficient way to get our daily exercise--little did we know that they were perfect conditioning for this hike. Cycling is great for leg strength and for cardio-vascular conditioning but every sport makes different demands on the body, and distance walking is no exception. The trail across a high basin a few hours into the hike. Long walks at fairly brisk speeds annoy my lateral hamstrings on the backs of my thighs in a way that cycling doesn't. While in Portland I had a chance to experience that and get help from a massage therapist with it. I kicked myself for not writing down his recommendations as I had planned to do, but as the old memories of the October pains became more vivid with the preparatory walks in New Zealand, the remedies slowly came back to mind too. Historically long walks always had been uncomfortable for my legs but the extra training got me past that barrier. For Bill, all of the walking back home helped anchor the brisker pace in his body that is needed to stay on schedule for activities like The Crossing where an awaiting shuttle bus at an appointed time is the only way off the mountain. We weren't sure that the great views were at the top of the next crest, but we knew we were nearing the summit. As we looked back on the vast, desolate expanse behind us as we made our last steep climb, it was hard to even guess the visual delights that awaited us. 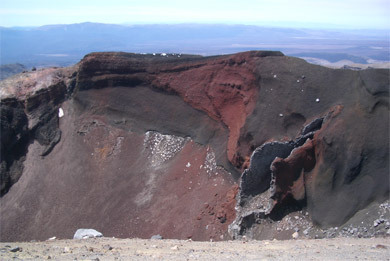 Once over the top on the narrow, steep, lose-rock trail, the inside surfaces of the startling Red Crater came into view. 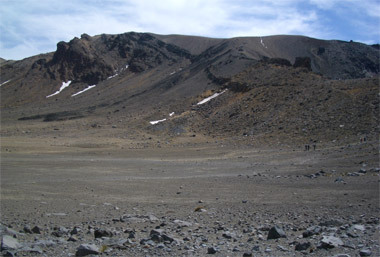 We'd been looking at the unremarkable outer surface of the crater for some time as we scrambled up the slope and its severely contrasting red and black volcanic material stood out from the muted browns and grays we'd been immersed in for hours. An inside surface of the stunning Red (& black) Crater. It was here that we finally understood that the real bug-a-boo with The Tongariro Crossing is that the spectacular sights are in the middle of the route, so doing a shorter 'out-and-back' from either end of the trail doesn't gain access to the best of it. And not only are the most stunning sights at about the half way point, they are primarily at or near the summit, so the interesting craters, lakes, and peaks are only visible if there is no cloud cover. We now comprehended that it really is a waste of effort to make the trek on anything other than a clear day. And of course, if it is too cold or too windy, you just can't take it in because of the distractions caused by the abuse to your body. Once arriving at the summit and savoring the stunning natural phenomena, we were all the more pleased with our good fortune at being there on what must have been the best day in months. We hadn't finished savoring all of the viewing angles of the Red Crater when the Emerald Lakes popped into view (the opening photo). Again, the vibrant colors were especially startling given the 'scorched earth' look of most of the surrounding landscape. Like many others, we stopped just off the summit for our lunch. We huddled behind a large rock to escape the worst of the summit winds while we quickly ate high above the lakes. A look back at the Red Crater & our path..
Once again we regretted being on a tight schedule for this walk as we would have happily lingered an hour to admire and study the spectacular sights. As it was, we only ate our sandwiches sitting down and munched on our chocolate and apples after we were down off the steep, scree slope and were walking across the next flat expanse. For all but the last hour of the hike in which we dropped to a lower elevation than our starting point, the hike was across near-barren land and it told the story of volcanoes. The big eruptions were long ago but numerous smaller eruptions in the last 100 years all had left still-visible marks on this terrain. The sights seen as you troop along read like the glossary in a geology book: lava flows, lava dikes, lava tubes, volcanic bombs, black unoxidized iron in basalt, red oxidized iron in the basalt, scoria, steaming fumaroles, sulfur springs, cones, explosion craters, crater lakes, and ejecta. The entire volcanic glossary isn't there, with thermal field specialties like mud pots and geysers being absent, but the list was long. The only thing we longed for were Department of Conservation signs labeling these natural phenomena, which you had to know or were left to wonder about. The chill of the previous day's hike had us heading out for The Crossing wearing just about all of the cold weather clothing with which we travel. As we hiked up the steep grades, we were pulling layers off as others were putting jackets on to ward off the wind. There was still a chill in the sharp wind at the summit, but in the last hours of the hike, I was down to my summer wear of sunscreen shirt and pants and a T shirt and our small packs were bulging with removed layers of clothing. Steam rising up from a hot spot in the lower elevation grasslands. The air temperature must have jumped into the 70's as we descended and we were suddenly shielded from the cooling wind by tall grasses. I finished off the last of my nearly 1 gallon of water I carried though we hadn't eaten all of our food reserves. We were grateful for the unexpected shade of trees along a creek that appeared in the last half hour of the tramp--trees that didn't exist at the higher, other end of the route. We'd had to scurry along faster than we liked to ensure arriving at the car park on time and though we were pleased to be in a half an hour early, would liked to have spent that time on the mountain. Our Crossing had gone better than we imagined possible 4 days ago when we were standing in a torrential downpour in Turangi. We had enjoyed our event on one of the best days on the mountain in a month or 2; physically we'd been up to the challenge; and our biking gear adapted for hiking had been just good enough for the situation. This was a happy ending to a story that had furrowed our brows for days before. However it only took standing to debark from the shuttle bus at our motel to discover a stiffness in our legs and hips that would likely be reminding us of our big outing over the next several days. Once again, the next morning we could make a general forecast in bed with the curtains closed, as the lack of streaming light was no doubt due to overcast skies. The ritual peek out the window confirmed what we'd both heard in the night: rain. It was only a light drizzle now, but what a contrast with the mostly clear skies the day before. While standing at the kitchen window I could tell for the first time that our backyard anemometer had 3 hemispherical cups on it and it actually stopped moving altogether once or twice. Since we'd arrived at our National Park village motel, the little device had whirled like it was intent on self destruction in the persistent winds. This wet, relatively warm day would be one of our few so far in New Zealand that wasn't accompanied by menacing winds. Tired "trampers" waiting for their respective shuttle buses. We rode south towards Wellington on Hwy 1 as planned but missed the daylong view of the mountains that should have been possible. As most days for the last 6 weeks or so, the mountains were socked in. But we'd been very lucky: we'd hiked for 2 days in and around the peaks under clear skies both because there had been a rare break in the weather and because the 2 day break had been accurately predicted. Conversations with other tourists that day reminded us of our good fortune. A Canadian man who travels around New Zealand once or twice a year by bike had come weeks before the Taupo bike race to escape the snows back home only to be clobbered by the wind and rain in New Zealand. Dashed were his plans for hill training in the sun as he settled for short loops in relatively sheltered areas. The Canadian cyclist told us of his first Tongariro Crossing several years ago in barely passable weather and had known others who had yet to have a good day on the mountain despite several attempts. We had heard of those who were reduced to traversing the summit on their hands and knees because of the high winds and saw little because of the thick clouds. And in the following weeks, we'd hear firsthand the stories from ill-prepared hikers who had brushes with hypothermia in the unexpected winds and rains and saw little of the show at the summit because of the cloud cover. A few hours after we left the Park area we spoke with a German couple at a roadside rest area. They were 4 weeks into their 5 week stay and were quick to share their tales of woe with the weather. They had spent most of their time on the South Island, which had been hit harder than the North according to almost every forecast we'd seen. Every stunning destination they went to was invisible in the rain and clouds, spoiling the husband's long awaited photographic expedition. We commiserated and knew of the more severe weather they'd endured. Like them, we'd repeatedly been thwarted by the clouds at high-point panoramas but unlike them, we had scored on our big-commitment outings: our 4WD ride from Rotorua out to the Mt Tarawera crater for a walk and our back-to-back hikes in the Tongariro National Park. Yes, the November weather had been incredibly bad but Bill's plan to start in the north and slowly work our way south had as expected spared us the worst of it. Our longer stay in the country had also given us more flexibility to work with the unseasonable weather problems. So, despite being thoroughly disappointed with the "summer" weather, unlike others, at least we'd had some stunning experiences. Should you be planning a trip to New Zealand and would like to include The Tongariro Crossing in your itinerary, take a look at our "Country Details" file for New Zealand for our very specific recommendations. We made our way to the southern tip of the North Island to the capitol city of Wellington, took the ferry to tiny Picton and spent about 2 weeks exploring the towns, sounds, and waterways of the northern tip of the South Island. With that spate of foot and water travel behind us, we are back on our bikes and heading south along the notoriously wet west coast of the South Island. We are at the midway point in our 4 month tour of New Zealand and feel like we will have enough time to see the best of the destination sites as well as get a good sense of the country itself. Our next big tourist "must see" sight is the Franz Josef glacier in the Southern Alps where we hope to do a guided glacier walk. We've reserved a room for 4 nights hoping to corral 1 good day for the outing, which is what we've learned to do in New Zealand. The often poor and always changing weather makes timing activities here a real challenge. After that we'll visit the Milford Sound in the far south and then begin working our way to the east coast of the island and then back north.